The 1X Control System is our ultra light weight, fixed length control system. The non-adjustable control bar features the QuickLoop™ opening harness loop and utilizes our all new TrimLight cleat system. QuickLoop’s safe and simple activation of single line flagging makes it possible to kill the power of the kite so it will rest motionless on the water or land. The TrimLite Cleat™ is a light weight, simple trim system, that uses a 2:1 purchase to give your kite the perfect balance and trim to match the changing wind conditions. TrimLite Cleat™ allows precise and positive trim adjustment. Cleanest easiest to use bar on the market! Safety release is super intuitive and easy to use. The de-power line shows little wear after lots of use. 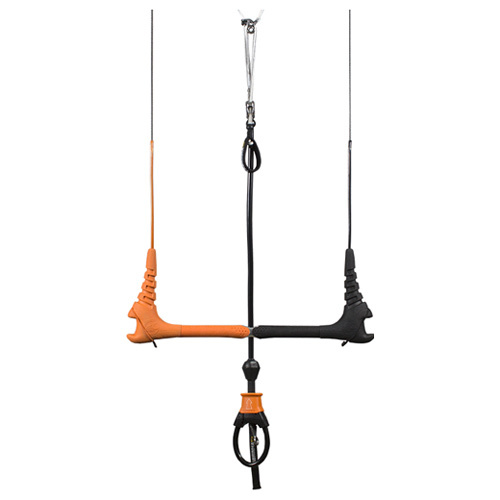 Having the de-power above the bar makes it easy to pull and the stretchy line on the cleat keeps it from tangling. I prefer the 44cm for my 9 m and under for freestyle in high wind. The 52cm for 10-13 m, and the 60cm for 14 m and above.